Robert R. Clancy, MD, is founder of the Pediatric Regional Epilepsy Program at CHOP, holder of the Tristram C. Colket, Jr. Endowed Chair in Pediatric Neurology, and Professor of Neurology at the Perelman School of Medicine at the University of Pennsylvania. 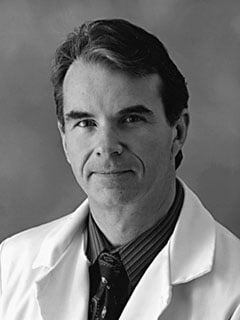 Dr. Robert Clancy is a native of Pittsburgh, PA, who received Bachelor of Science degrees in mathematics and chemistry from Georgetown University and his MD degree from the Johns Hopkins University School of Medicine in Baltimore, MD. He performed his internship and residency training in general pediatrics at the Johns Hopkins Hospital and pediatric neurology and clinical neurophysiology fellowships at Stanford University Hospital in Palo Alto CA. He joined the faculty of the University of Pennsylvania School of Medicine in 1981 and is now professor of Neurology and Pediatrics. He is the founder of the Pediatric Regional Epilepsy Program at The Children’s Hospital of Philadelphia and directed that program from 1989 until 2008. His clinical and research interests include neonatal neurology, neonatal seizures, neuroprotection, pediatric EEG and epilepsy. He is a member of the CHOP Pediatric Pharmacologic Research Unit (PPRU) and holds the CHOP Child Neurology Research Chair. He is involved in international medical education including the Salzburg medical seminars, Korea, China and Dubai, United Arab Emirates. He served as the principal investigator for the single-center NIH sponsored “Allopurinol Neurocardiac Protection Trial” and site PI or co-investigator for other NIH-sponsored trials, including the multi-centered “Childhood Absence Epilepsy” study. He has authored or co-authored 89 full length peer-reviewed research articles, 121 abstracts, 43 chapters in textbooks and co-authored the 3-volume “Atlas of Electroencephalography”. He has given over 200 invited lectures nationally and internationally. Grasty MA, Ittenbach RF, Knightly C, Solot CB, Gerdes M, Bernbaum JC, Wernovsky G, Spray TL, Nicolson SC, Clancy RR, Licht DJ, Zackai E, Gaynor JW, Burnham NB. Hearing Loss after Cardiac Surgery in Infancy: An Unintended Consequence of Life-Saving Care. Journal of Pediatrics. 2018 Jan;192:144-151.e1. Schultz AH, Ittenbach RF, Gerdes M, Jarvik GP, Wernovsky G, Bernbaum J, Solot C, Clancy RR, Nicolson SC, Spray TL, McDonald-McGinn D, Zackai E, Gaynor JW. Effect of congenital heart disease on 4-year neurodevelopment within multiple-gestation births. J Thorac Cardiovasc Surg. 2017 Jul;154(1):273-281.e2. Bean Jaworski JL, Flynn T, Burnham N, Chittams JL, Sammarco T, Gerdes M, Bernbaum JC, Clancy RR, Solot CB, Zackai EH, McDonald-McGinn DM, Gaynor JW. Rates of autism and potential risk factors in children with congenital heart defects. Congenit Heart Dis. 2017 Jul;12(4):421-429. Smith DM, Dicker LH, Davis MJ, Clancy RR. Measuring the Severity of Neonatal Seizures: Temporal-Spatial Burden. J Clin Neurophysiol. 2017 Mar;34(2):151-157. Diaz LK, Gaynor JW, Koh SJ, Ittenbach RF, Gerdes M, Bernbaum JC, Zackai EH, Clancy RR, Rehman MA, Pennington JW, Burnham N, Spray TL, Nicolson SC. Increasing cumulative exposure to volatile anesthetic agents is associated with poorer neurodevelopmental outcomes in children with hypoplastic left heart syndrome. J Thorac Cardiovasc Surg. 2016 Aug;152(2):482-9. Stevenson NJ, Clancy RR, Vanhatalo S, Rosén I, Rennie JM, Boylan GB. Interobserver agreement for neonatal seizure detection using multichannel EEG. Ann Clin Transl Neurol. 2015 Oct 1;2(11):1002-11. Skjei KL, Church EW, Harding BN, Santi M, Holland-Bouley KD, Clancy RR, Porter BE, Heuer GG, Marsh ED. Clinical and histopathological outcomes in patients with SCN1A mutations undergoing surgery for epilepsy. J Neurosurg Pediatr. 2015 Dec;16(6):668-74. Maryam Y. Naim, J. William Gaynor, Jodi Chen, Susan C. Nicolson, Stephanie Fuller, Thomas L. Spray, Dennis J. Dlugos, Robert R. Clancy, Livia Vianez, Daniel J. Licht, Nicholas S. Abend: Subclinical Seizures Identified by Postoperative Electroencephalographic Monitoring are Common Following Infant Cardiac Surgery. J Thoracic Cardiovasc Surgery 2014. Abend NS, Topjian AA, Gutierrez-Colina AM, Donnelly M, Clancy RR, Dlugos DJ: Impact of Continuous EEG Monitoring on Clinical Management in Critically Ill Children. Neurocrit Care. 2011 Aug;15(1):70-5. doi: 10.1007/s12028-010-9380-z. J. William Gaynor, Gail P. Jarvik, Marsha Gerdes, Daniel S. Kim, Ramakrishnan Rajagopalan, Judy Bernbaum, Gil Wernovsky, Susan C. Nicolson, Thomas L. Spray, Robert R. Clancy: Post-operative Electroencephalographic Seizures are Associated with Deficits in Executive Function and Social Behaviors at 4 Years of Age Following Cardiac Surgery in Infancy. J Thoracic Cardiovasc Surg 146: 132-9, 2013. Tsuchida T, Wusthoff Courtney J, Shellhaas Renee A, Abend Nicholas S, Hahn Cecil, Sullivan Joseph, Nguyen Sylvie, Weinstein Steven, Scher Mark, Riviello James J, Clancy Robert R.: ACNS Standardized EEG Terminology and Categorization for the Description of Continuous EEG Monitoring in Neonates. Report of the American Clinical Neurophysiology Society Critical Care Monitoring Committee Journal of Clinical Neurophysiology 30: 161-173, 2013. J. William Gaynor, Richard F. Ittenbach, Marsha Gerdes, Judy Bernbaum, Robert R. Clancy, Donna M. McDonald-McGinn, Elaine H. Zackai, Gil Wernovsky, Susan C. Nicolson, Thomas L. Spray: Neurodevelopmental Outcomes in Preschool Survivors of the Fontan Procedure. J. Thorac Cardio Surgery 2013. Clark A, Mondick JT, Cloyed J, Zuppa A, Ling X, Raol Y and Calcy RR: Pharmacokinetics of Intraperitoneal Topiramate Administered to Neonatal Rat Pups. Pediatric Research 73: 317-324, 2013. Wusthoff C and Clancy R: Neonatal Neurology in Fetal & Neonatal Secrets. Hanley and Belfas,Philadelphia (in press) R Polin and A. Spitzer (eds.). 2013. Massey S, Clancy R, Digiovine M, Fitzgerald MP, Fung F, Shou H, Farrar J, Abend NS. Inter-rater agreement in neonatal electroencephalogram background scoring. American Epilepsy Society Annual Meeting, Dec. 2017, Washington, D.C.